Potty training is something that I honestly knew very little about until recently. When students are in my classroom they are generally potty trained, so I don’t really have much to do. But as I am spending more time being in the office and helping out in other classrooms I am learning all about potty-training. I felt that I should share all that I am learning with you. Here is a great example of how our school has the students clothes to change into. Each bin is labeled and there is even a step stool if the kids can’t reach! The component that surprised me the most was about how much you need to do for the children before they actually start the training. Quinn, our Head of School, has potty-trained students for almost 18 years here at ADM and had a lot of great information. She suggested that you start to expose children to the potty from a young age. Allow them to observe you so that they are able to see the process that is needed. Simply modeling for children is one of the best ways to teach them. Also have a training potty in the restroom before they beginning training so that know what it is. It is also is important that you set your child up for success when it comes to using the bathroom and their clothes. When you dress your child in outfits that are hard to take off such as rompers, onesies, or overalls, they are more likely to have an accident due to not being able to take off their clothes in time. This is why you want to dress your child in things that they are able to take off and put on with independence. This not only makes it easy for them to take off the clothing when they need to go but also helps if they have an accident. We have potties as well as small toilets for children to be able to use during the day. 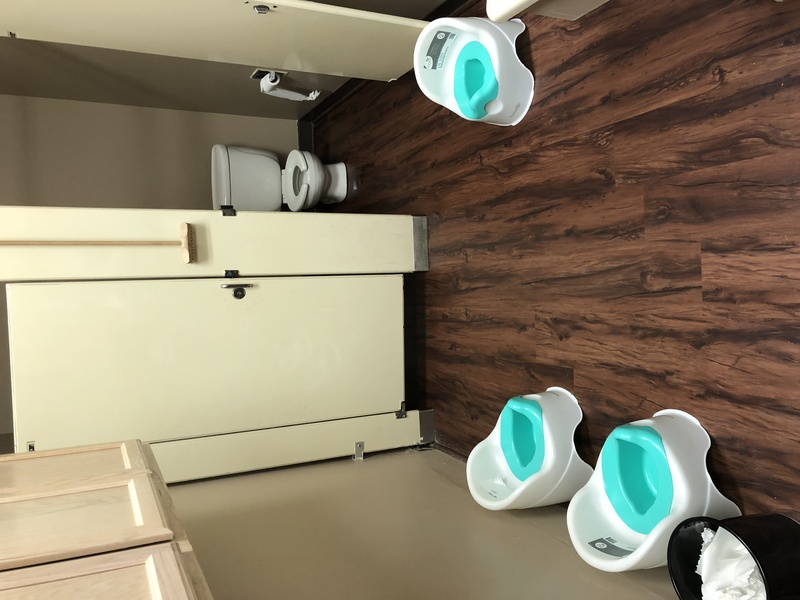 Once you see that your child is curious about the toilet, they are ready to start potty training! Once this process starts it can be helpful to put potties in key locations around the house. 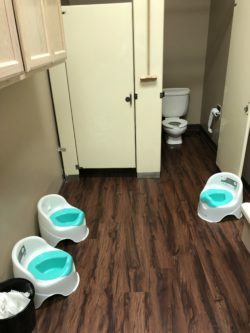 This is a suggestion because in the beginning when your child starts to feel the urge to use the restroom, they end up going very soon after. When your child does use the potty make sure you are encouraging them not praising them. For instance “doesn’t that feel so awesome?” rather than “I liked it when you used the bathroom!” By making it about them your child will begin to want to use the restroom for themselves and not to make an adult happy. There are also things that you are able to do to help encourage them to use the bathroom and make your child autonomous. Remind them to try to use the bathroom every 30-45 minutes. Simply make it a part of your routine and then it is not as much of a new scary thing. It is also good to prepare for your child to have an accident. 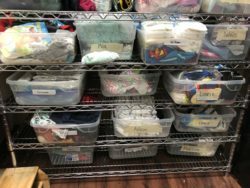 Have clean clothes they are able to put on independently, a place to put their wet clothes, and allow them to change themselves. They will take ownership of what happened and learn the logical consequence. Potty-training is a huge step for our little ones. It is important to work on being consistent, confidant and calm during this time. Know that accidents will happen and so will super successful days! I hope that this information helps you along your potty-training journey.